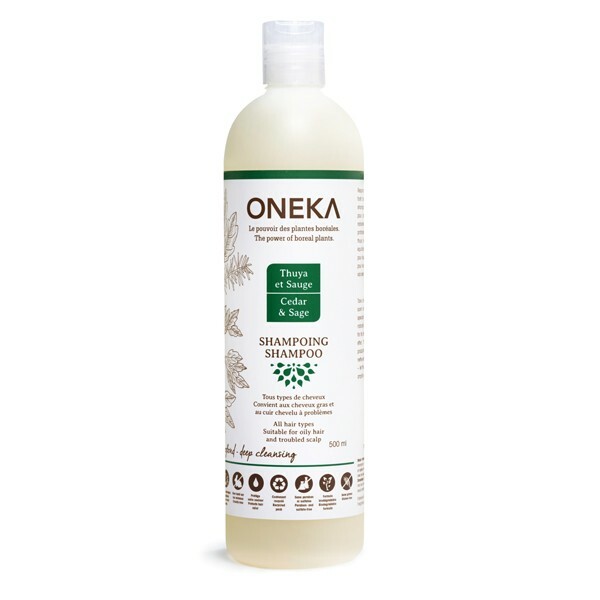 This Cedar and Sage Shampoo (500 ml) allows you to take a deep breath of the Boreal forest’s rich, earthy scent and enjoy our cedar and sage shampoo, specially formulated to help revitalize your scalp naturally. Your hair will absorb the cedar, known for its antibacterial properties, for a deep cleansing effect. The sage, known to help balance sebum production, blends with the hemlock, burdock, and nettle extracts to invigorate and stabilize. Go ahead ? let the scent of the forest soothe your soul and amplify your senses. Hair Condition: For all hair types. Suitabe for oily hair and troubled scalp. Allow your senses to realx as the burdock and nettle extracts in this body wash invigorate your skin. The touch of hemlock assists as hemlock is known for its stabilizing and balancing effects. All Oneka products are made from fresh field plants. Purified water, Calendula officinalis (organic marigold herb blend), Arctium lappa (burdock root), Salvia sclarea (clary sage), Urtica dioica (nettle leaves), Rosmarinus officinalis (rosemary), Taraxacum officinale (dandelion), Equisetum arvense (horsetail), Decyl glucoside, Cocamidopropyl betaine, vegetable glycerin, Cannabis sativa (hemp seed oil), Pantothenic acid (vitamin B5), guar gum, citric acid, Essential oil blend of Melaleuca alternifolia (tea tree), Citrus reticulata (mandarin orange), Thuja occidentalis (cedar), Tsuga Canadensis (hemlock), polyaminopropyl biguanide.